This is a nice clean, rare, 13.3" long, heavy duty type screwdriver with the hex shape near the handle for using a wrench while driving screws, for additional leverage, very sturdy! 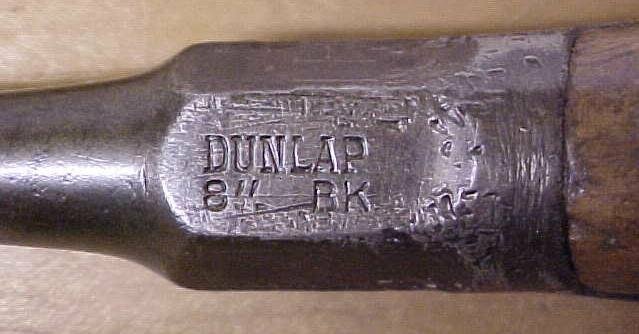 This one is marked "DUNLAP 8" BK" on the hex section of steel between the main shaft and the wood inserts of the handle section. Dunlap measure their screwdriver by the length of the shaft only (excluding the handle), instead of the overall length. The handle is made up of two wood sections, pinned in place with steel, large head rivets, and the wood is completely surrounded by metal on both ends and the center metal core on one side. This design proved to be about the best made, longest lasting handle type for heavy duty tools over the years. 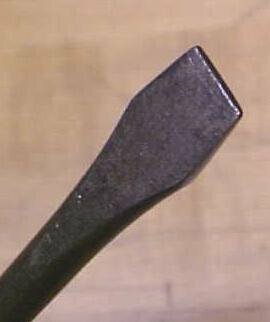 There is some wear on the wood parts of the handle, a few dings and scratch, but overall in very good shape. The metal is clean, and the tip is very nice, shaped to be used on medium/large slot screws, and works very well for a fact! The tip is about 7/16" wide at the end. A very hard to find model! One of the nicest we have seen in this style over the years! If you are looking for a top quality 13" machinist's slot screwdriver, this one is highly recommended! Items Similar To "Dunlap Machinist Screwdriver w/Perfect Wood Handle 13 inch"
Dunlap Machinist Screwdriver Wood Handle Rare!